As a follow up to my initial blog post from a couple of weeks that looked at Athlete Development Pathways in both Australia and Canada, I asked some of our top athletes, Lizzie Ingham, Tim Robertson and Matt Ogden, a few questions about how they have progressed from starting out at orienteering to competing on the world stage. What pathway have they followed? What were the steps taken and how can we help others take the same steps? A huge thanks must go to Lizzie, Tim and Matt taking for taking the time to answer these questions, I’m sure what they have written will be of great interest to many. 1) Please give a couple of sentences of overview as to your orienteering career so far, how did you begin, how did you progress through school, JWOC etc, what opportunities did you have? Lizzie Ingham: I was pretty much born into orienteering. My parents took up the sport when they were at uni and I got taken along to my first event when I was 3 days old – on my way home from the hospital! So I very much grew up as a part of the orienteering community. Starting from club events, being taken to regional, national, and australian events from a young age, and competing in each of them once I was old enough. I went to national junior training camps from when I was 13, and was lucky enough that the NZSS trips to Aussie started again when I was year 11. In my last year of school I went to the first of my 4 JWOCs which initiated a steep learning curve! My first couple of years in Elites I competed in world games and world cup races, which were real eye openers to the step up required for competing internationally in elites and motivated me to put in the extra effort in training. Since then I’ve competed at WOC each year, with Scotland this year being my 5th WOC. Tim Robertson: I started orienteering in 2005 after my sister joined her school team and me and Dad got sick of waiting for her to return from the forest and decided to give it a go too. I am a proud member of the little Hutt Valley orienteering club that have helped with my progress over the years. I was the only orienteer in my school so all of my training was done on my own, with my family or with a training group of Elite orienteers in Wellington called the O-gang. My older sister Laura and I were welcomed into the O-gang when we were very young and training with these orienteers has been something I feel has greatly contributed to my orienteering success. I made my first New Zealand team in 2009 and travelled to Australia every year since to compete in their nation championships and schools challenge. At the JWOC level I was extremely lucky to have this experience at a very young age. Looking back maybe too young. I raced in my first WOC the following year. Matt Ogden: I started orienteering through Gene B. when we were both at primary school. I travelled a lot with the Beveridges to orienteering competitions, both at school and club level. We had some great times and Debbie always made awesome snacks (chocolate banana cake!) when we went away for competitions. I competed at 3 Aus-NZ schools ’06,’07 and ’09 (Perth, Canberra and Victoria). These were really fun competitions and opened my eyes to the ‘bigger world’ of orienteering. Throughout high school I was never that focused on orienteering, doing a lot of other things. I loved football and played/followed it religiously. I focused a lot on my studies, both at high school and then into university. I am a massive competitor, and loathe losing, not just in sport. I remember being quite devastated when I didn’t get dux in my final year of high school. I ran my first JWOC in Denmark, during my first year of University, then two more after that in Poland and Slovakia. I had numerous opportunities to compete in orienteering, enabled by a very supportive family. I got fairly obsessed with orienteering during university, with Gene and I (along with many others) assisting with the birth of AOTC which was imperative in furthering the training environment in Auckland. We built a culture of training, and bettering our orienteering which is still prevalent today. 2) What events, trips or camps do you think had the largest effect on your success? National Junior Camp, when I was 13-15, really instilled the navigational techniques, and were great fun socially too. NZSS trips to Aussie, introduced racing in different terrain, travelling in the team environment, and realising I was as good as the Aussies. JWOC trips are really an eye opener as to just how serious the sport is in European nations and just how high the standard of orienteering is over there! Making the A final in my first year was a huge achievement and big surprise, but was the first hint that made me wonder if maybe I could foot it with Europeans. The 4 long distances I ran at JWOC probably rank as 4 of the toughest races I’ve ever done, and all showed just how strong the Europeans are, and how much work would be required to be consistently competitive internationally. World Cup 2010 and WOC 2010. I headed over to Europe early and ran the Nordic Tour world cup races. I got utterly smashed. World Cup races in Scandinavia are the toughest races around I reckon – the European nations have large teams with the world’s best in them. It showed me that even if I was at the top of the NZ elite field that it meant nothing on the World stage! I was supposed to race WOC 2010 in Trondheim, but got a fracture in my ankle a month beforehand. I went anyway to watch the last couple of races, and it was inspiring to see the scale of WOC – it made me realise I didn’t want to just make up the numbers at WOC, I wanted to be there to really compete. TR: The junior orienteering camp has had a huge effect on my orienteering. My first year going was in Wanganui with some of the best NZ orienteers as coaches. I learnt a lot here and it was always so much fun spending a week with friends from over the country. Since then I moved up to the position of being a coach on these camps. I thought that the learning would stop, but having to explain how you orienteer to a beginner is challenging and makes you have to stop and think, ‘ok, how do I actually approach orienteering’? When you explain this to others it gets drilled into your head as well. All of the overseas trips have also had a large effect. They have made me realise that this is a sport I really enjoy and want to do and lead to my move to Norway at the start of this year. MO: Of course it was some time ago but I think the school trips and junior/d-squad camps were very influential in my development as an orienteer. A big part of orienteering as a junior is spending time with friends, doing something that we all love. So of course these trips had a big impact on building my passion for the sport. I would say that my orienteering life changed dramatically when I experienced orienteering in Europe for the first time in 2010. 3) What people do you feel had the biggest impact in contributing to your success as an orienteer? LI: Definitely Mum and Dad. Mum (Gillian) competed at WOCs for NZ in the late 80’s, while Dad (Malcolm) coached her. So I couldn’t have asked for better role models and advisors! They’ve both been fully supportive the whole way. I was also really lucky to grow up with a group of similar aged girls to train with, compete against, and be friends with. So there was always motivation to go to events, and later on, to train properly. TR: First of all my sister Laura for getting me and my family into the sport. It makes it easy when your whole family is involved. A holiday for our family is driving ten hours in the car together to run in Wood hill forest and then turning around and driving home again. It has always been great having three people always around me who I can talk about orienteering with and who understand what I am talking about. Next is the O-gang. Getting invited along to training with these guys was a big deal for me. I was 11 or 12 I think and getting asked to come along to training with some of New Zealand’s best orienteers. It was great to be a part of a group so far above my ability. We met together once a week for orienteering or running and had many training camps up the Kapiti coast. They taught me a lot and it wasn’t long before I was starting to compete on harder courses and in higher age grades. Nick Hann’s sudden jump into orienteering when I was in secondary school is maybe one of the biggest impact on my orienteering. Up until then the competition in Wellington was in the elite grades and I was not at that level yet. But when Nick Hann with his amazing navigating skills started to run like a beast I had the perfect training partner. For 6 or 7 years now we have been motivating each other and competing against each other, often finishing seconds apart. It’s great to have a friendship and training group like this, it makes training not seem like a chore anymore, but something to look forward to. MO: I have done well at times because I have had some really great support networks. My family, my coaches, my friends have always encouraged me. James Bradshaw, Ross Morrison, Mike Beveridge, Rob/Marquita, Greg Flynn, North West Orienteering Club, just to name a few. I like to listen, and I think that everyone has something to contribute to your own development. So much of orienteering is about experience and being able to react correctly based on experience. The more experienced people you associate with, the greater your own experience base can become. 4) What do you feel has been most valuable support you have had from either your club and/or Orienteering NZ over the years? LI: Definitely the national junior camps and d-squad camps from ONZ, getting to learn from the experience of former and current elites. From Wellington Club, I can’t pinpoint one thing; they’ve been fully supportive right from the start through to present, financially when possible, but much more important has been the moral support. TR: My club has been a really big support for me. We aren’t a big club but they have always gone out of their way to show that they recognise my achievements in the sport. MO: I belong to the best club in NZ who have supported me so much (perhaps a little biased). I am totally inspired by how my club operates and the people who comprise it. NWOC get things done, in a professional manner and have fun whilst doing it. 5) Is there anything you would change in terms of how NZ supports athletes? LI: I understand the limited financial and manpower resources that ONZ has to work within – so although most of the obvious answers to this question involve more financial resources, I won’t go into them. In terms of development from juniors/beginners into seniors/advanced, we should perhaps then focus on the events that drive development. Camps (enjoyment and experience): national junior camp (getting a good mix of senior, experienced coaches (elites and older), and junior trainee coaches (oldest juniors and young elites)), national development squad camps, and national elite camps (which have been missing for a while!). Exposure to competition (realising the next step and motivation): NZSS champs, the schools team to Aus, JWOC, World Cups. Top level competition (turning motivation and training into results): Aus test match, JWOC, WOC. After 10 years competing overseas I can say there is no other nation where the elites have to pay for everything (aside from WOC entry). We fall into an unfortunate zone of being a small orienteering nation; with little financial support from Sport NZ, but we’re not small enough to get support from IOF. Plus, to kick, we’re on the opposite side of the world from the big competitions! So even if the money isn’t there, what would go a long way is recognition of the time, money and energy commitment that our top juniors and elites are making. This can be as simple as reducing the extra stresses. things like not sending us our WOC invoices the day before the first WOC race! To be fair, the last couple of years have seen improvements – last year we had accommodation for WOC booked more than one month out, and the WC in Sweden, it was great to turn up to accreditation and find that our accreditation had been paid in advance and I didn’t have to put it on my credit card there and then! TR: It would be nice to get some more media behind the sport. We have had 6 JWOC podiums in 4 years and no one but orienteers knows. With these excellent results we should be able to pick up some sponsors to help athletes with the large costs involved with travelling to Europe for competition. Some more camps for all levels of orienteering I feel would also help to build the sport. MO: Of course the dream scenario would be to have all our expenses paid for when representing NZ, to have more training camps, to have access to nutritionists/physiotherapist etc and to have more people involved and supporting the national team. But of course, in reality we cannot expect this given the size of our sport. 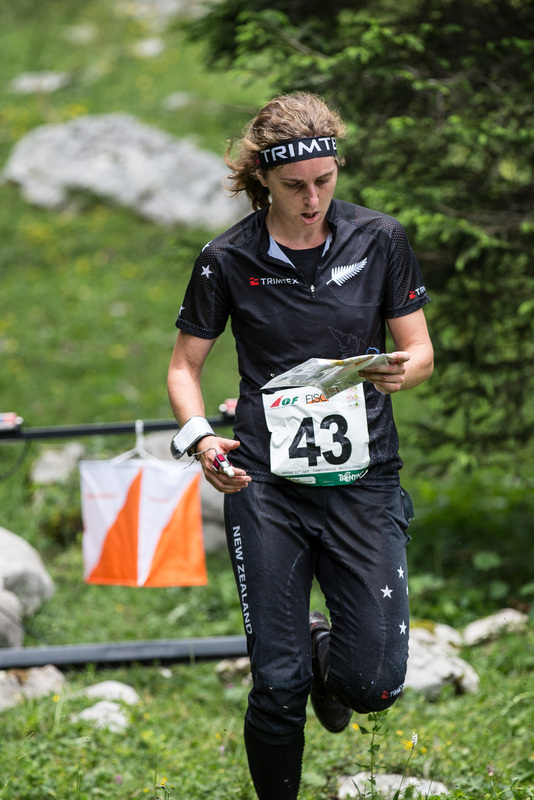 Ultimately being an elite NZ orienteer is a choice, and so is to represent NZ. Therefore we as individuals must find a way to support ourselves, and then try and compete against people/countries whom get almost everything handed to them. 6) How do you feel your transition has gone from competing at a Junior level to competing at a Senior level? LI: It’s a big step. But I was lucky to have the older elite girls to run up against while I was a junior, so making the step within NZ was OK. Similarly testing myself out against the Aussie elites was step up from within NZ. Once I’d got a handle on racing elite within NZ and AUS, then it was a further step up to racing elite in Europe. TR: It is great having the Schools team as a stepping stone to the JWOC team. I started to run elite men when I was around 13. But I carefully choose the races I would compete in. At first I only ran sprints, then gradually I started to do some elite middles, and then longs came last. MO: The first thing I learnt when becoming a senior was that all my junior achievements were nothing. They can be little confidence boosters, but in the senior world it is your last result that anyone remembers or cares about. Secondly, I learnt to get beaten and have all my confidence stripped away. It is only then that I could begin to build myself back up, piece by piece, into a stronger athlete and orienteer….and this is where I feel I currently am at. I am starting to make progress as a senior orienteer, but there is still so much further to go. There are so many more challenges to being a senior athlete than a junior, such as making the economy work and finding the correct life balances to sustain motivation and progression. 7) What could be done to ease this transition? LI: For me, it was a case of getting exposure to the level of elites; in NZ, Aus and overseas. Firstly through observing, then through trying out racing against them, and finally training and working my way up through the field. I feel working my way through each of those steps, firstly in NZ, then Aus, then overseas, really broke the big step up into smaller, manageable steps. TR: The step from the junior level to the senior level on the international level is huge. You want to make this transition in small competitions. Start running senior at local competitions for shorter courses. Then when you are feeling comfortable doing these start to run them at regional competitions, then nationals etc. MO: Develop good planning skills, and not to have too high expectations. Realise that it takes time to adapt, and that change does not happen overnight. I don’t think there is so much that other people can do to ease the transition, but to offer you some ‘support’ when needed. Otherwise it is simply a matter of figuring out how best to cope with any changes involved in the transition, make mistakes, learn and to always take note of the bigger picture (to have fun). When I ask myself why I do the sport, I think a big part is the challenge. I enjoy challenges and becoming one of the world’s best orienteers is a pretty daunting challenge for a NZer, but it motivates me for the time being. 8) Your thoughts on the need to live in Europe vs NZ/Australia in terms of being competitive at an elite level? LI: It comes down to experience I think. I don’t think it’s vital to live in Europe if you want to get a top result at WOC or JWOC, if it’s in continental (more neutral) terrain, or if it’s a sprint. The likes of Matt, Tim, Nick and Angela have proven this, it just takes talent, motivation and hard work! If, however, you want to be competitive in Scandinavian terrain, then you need experience in it. And if you want to be consistently competitive (not just one race or series), then yes, you probably have to, if not be based, at least spend significant preparation and training time in Europe. TR: I made the decision at the start of this year to move to Norway to prepare myself for this year’s Junior World Champs and next year’s World Orienteering champs. However Angela, Matt, Nick, Shamus, Lizzie and I have shown that competing in training in New Zealand can still get you to the podium. You need to be very motivated and prepare yourself well for the events. But if you have the right approach it is easily achievable. MO: I think that the hybrid solution is the best; both environments have their benefits and drawbacks. Being from a country like NZ, we really have to capitalise on the fact that we don’t have to spend 4months of the year battling the cold, the darkness and the almost certain likelihood of sustaining an injury because of the conditions. But again it comes down to what you want out of your orienteering, and your life. It is a fairly big challenge to move to Europe, and there have been plenty of cases where people have not improved after moving. In my opinion, it doesn’t depend so much on where you are in the world, but making the situation work and being amongst supportive people. In Europe it is just so nice to have the proximity to so much orienteering, and in Uppsala the maps are some of the best in the world! I must say, living in Europe can be a fairly grim beast, especially because the support networks are significantly reduced (which are so important in maintaining confidence). Being away from family and friends and living in a completely foreign environment has its challenges. My thoughts, and approach for the future is to learn from the Scandinavians, but not to become one of them. Being a successful elite athlete is about being unique, and finding some strengths that are specific to you, strengths that you can have complete confidence in come race day.